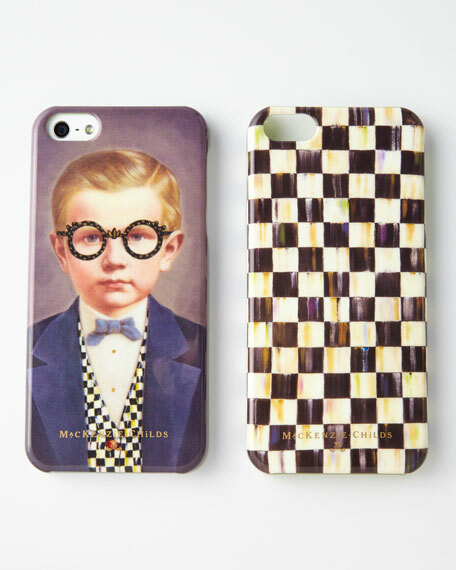 Protect your iPhone® 5 or 5s in true MacKenzie-Childs® style with one of these fun snap-on cases featuring iconic Courtly Check® designs. Snaps on tight to back of iPhone® 5 or 5s. Available in Newt (boy wearing glasses and Courtly Check® vest) or overall Courtly Check® designs; select design when ordering. 2.33"W x 0.4"D x 4.88"T.
Established in 1983, MacKenzie-Childs is located on a 65-acre former dairy farm in Aurora, New York. Alongside a small herd of Scottish Highland cattle, hens, and a duck pond, artists create ceramic tableware, furniture, and home accents by hand using time-honored techniques. From enamelware and glassware to furniture and decorative accessories, MacKenzie-Childs combines vibrant colors and patterns to create a collection that epitomizes "tradition with a twist" that has earned a worldwide following of loyal fans who are drawn to the line's whimsical style and dedication to quality.